I have been mostly working on sehle (Khayyam rendering engine) based game framework lately. There have been some new things in Khayyam - that will be the scene/level builder for it - as well. The latest addition is reflective water material. 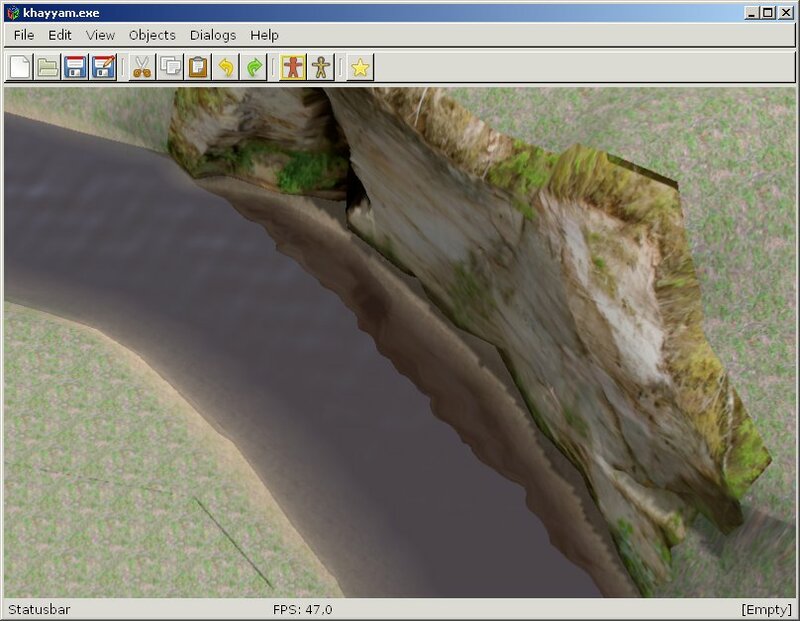 You can convert all static objects (OBJ, 3DS and Collada) to water bodies - although to get realistic results, they should be bowl- or plane shaped with surface at Z zero (in object coordinates). Everything is fake, of course - there are no real waves or refraction, but only distorted reflections and transparency. But it still looks reasonably good in my opinion. At the image below you can see how the water color changes from almost fully transparent near bank to completely opaque brown at the middle of river. As the viewing angle is high, overall reflectivity is low and the colors of river bottom and water can be seen. 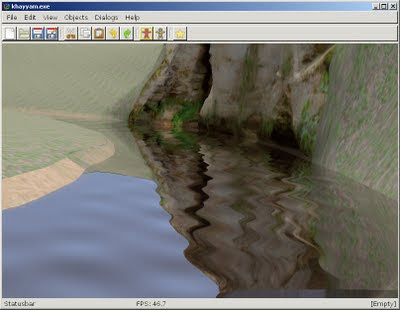 Ripples change the apparent angle between viewer and water surface, so although sky is uniform color, ripples still show as they change the reflectivity of surface. At the next image the viewing angle is low and thus the surface of water is almost completely reflective. Ripples are circular and their wavelengths, amplitudes and generation points are updated randomly over time. Thus the actual pattern almost never repeats - although sometimes it is not as nice as on the image above. When I find some free time, I'll write the technical details about the actual mathematics in shaders. And hopefully there will be new Khayyam release too.